This list seems way too short, I've got to say. Really no approved killings before Judges without divine intervention? Thanks, Leor. I've added them. Let me know if I've missed any others. Yeah, I agree, Brucker. I was surprised when I went through the first six books and couldn't find any more. Are there any in Genesis - Joshua that you think should be included? I don't know, Genesis 14 has a war that seems to be approved by God, but it doesn't explicitly say God approved, nor that anyone was killed. I can't think of anything else. Got it; how about Exodus 2:12? It's arguable. I don't see it as condoned, but Moses certianly never gets punished for it. Yeah, Brucker, Exodus 2:12 comes pretty close. I Exodus 4, God nearly kills Moses for not circumcising his son, but he doesn't say a thing when Moses murders an Egyptian. Still, I'd like the text to be more explicit. It looks like God approves, but the case seems pretty weak. I think you could include Lazarus's death in this list, Steve. Jesus knew he would die, and could save him, but he's chosen to wait for two days, so he could die, and use his death as a miracle. John 11:6 When he had heard therefore that he was sick, he abode two days still in the same place where he was. What about 2 Kings 6:28-29 and Lam 4:4-11 taking into account Lev 26:29 and Deu 28:53? Do they fit in here? They might deserve mention in some list. Ever wondered what happened with the 200 philistean foreskin David gathered? Saul thought it had no value, but David held, they'll be good for dogs and cats as food! Leor: I thought about adding Judges 15:8, but I don't see how we can be sure that God approved of Samson's "great hip and thigh slaughter." But I probably missed something. Leor: I don't think I can count 2Chr 15.9-15, although it is an especially nasty passage: If you promise to kill non-believers, God will give you peace. King Asa and the people took the oath and God blessed them for it. But did they actually kill anyone? Leor: I'm not sure about 1Kg 12:18. Did God approve of the stoning to death of Adoram or did the people just do it because they were pissed off? 2Chr 15.9-15: Whoops. Apperantly I read this passage as it is described in the Brick Testament (that shows the bodies of the unbelievers). 1Kg 12:18: The people being pissed off thing was part of God's plan to split the kingdoms. Brucker, in Genesis 14, Melchizedek did thank God for blessing the war; doesn't that count for something? Also, what about the golden calf? God didn't raise a hubbub over all the people Moses killed; doesn't his silence on this matter mean that he implicitly approved of it? (Got this from a NonStampCollector YouTube video) Jephthah's men of Gilead kill 42,000 (Judges 12:4-7). But Paul states approval (Hebrews 11:31-32). Would that count? It works for me, teavee. I've added the 42,000 that failed the famous "Shibboleth" test! Just a thought, should non-God committed/approved (mentioned by others) but poorly justified killings by supposedly good people of God be included in the master list for completeness as yet another category? And maybe a category for untimely accidental deaths like the tower collapse which might still be viewed as an act of God in some way. 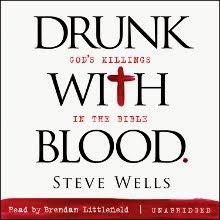 Categories for killings/deaths might be God-committed, God-approved, other killings (unjustified, questionable, justified? ), accidental, natural. How much more effort would it take to categorize all of the interesting deaths in the Bible? Are there many more after God-committed/approved? Over at Debunking Christianity, John Loftus has a partial list of the child sacrifices in the Bible. Don't forget the kids! Does he include Jephthah's daughter in that list? "What a treasure hadst thou!" I heard that Satan Has only killed 1. Lot's wife. "David's slaughter of the Amalekites 2Sam 1:1"
It's not a god approved killing. The text talks about God's 66th killing. Leor: Could you explain what you mean about 2Sam 1:1 a bit more? Talisman: What did Satan have to do with Lot's wife. Maybe you're thinking of Job's children? The last story concerning David in 1 Sam was God's 66th where David slaughters some Amalekites. I think that verse simply mentions this killing (in other words, David killed the messenger [2 Sam 1:15] shortly after that very slaughter). Yeah, you might be right about that, Leor. And there I was thinking the Allah/Mohammed tag team was bad! Hey there, are these all 100% God approved killings? Specifically the ones King David committed? Thanks for your input!